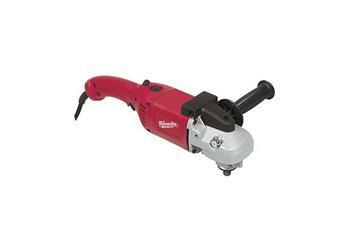 This 13 amp, 5000 RPM, 2.25 maximum horsepower sander provides high performance and durability for moderately heavy jobs. Sold without accessories, a 7 or 9 inch backing pad and disc can be attached allowing this tool to be used for removing paint or rust from metal, plastic and fiberglass surfaces. Spiral bevel gears transfer maximum torque for heavy duty jobs. Spring loaded recessed spindle lock assists in easy accessory changes. This tool can be converted to a grinder by purchasing either a 7 inch or 9 inch guard and wheel which are easily attached to the tool. Grinding applications remove more material and may be used to shape metal.